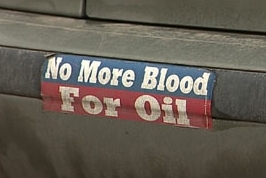 The bumper sticker that led to the removal of three people from the Bush campaign event. 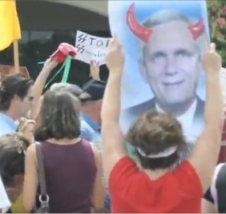 [Source: 9News (.com)]Three Denver residents are forcibly removed from a town hall meeting with President Bush after Bush security personnel observed their car had a bumper sticker reading “No More Blood for Oil.” The three obtained tickets for the invitation-only event through the office of Representative Bob Beauprez (R-CO). [ABC 7 Denver, 3/29/2005; Associated Press, 3/29/2005] One of the three, lawyer Leslie Weise, is stopped at the security checkpoint, asked for identification, and told to wait for the Secret Service to arrive. Eventually, Michael Casper, a White House staffer who is not a Secret Service member but is dressed in a dark suit and wears an earpiece and lapel pin, arrives and warns Weise that she has been “ID’d” and that if she has any intentions of causing trouble, she will be arrested. She then moves through the checkpoint and towards her seat. As is later ascertained by witnesses, Casper then consults with other White House event staffers who saw the bumper sticker and tell him that White House policy is to prevent anyone attending a presidential event if they disagree with Bush’s positions. Casper then prevents the three from taking their seats, and escorts them to the exit, putting his hand on the elbow of Weise’s fellow attendee, marketing coordinator Karen Bauer. [ABC 7 Denver, 3/29/2005; American Civil Liberties Union Foundation of Colorado, 11/21/2005 ] The Secret Service denies any involvement in the incident: “The Secret Service had nothing to do with that,” says Lon Garner, special agent in charge of the Secret Service district office in Denver. “We are very sensitive to the First Amendment and general assembly rights as protected by the Constitution.” The Secret Service will mount an investigation [ABC 7 Denver, 3/29/2005; Associated Press, 3/29/2005] , and recommend that Casper be charged with impersonating a federal officer; the Justice Department will refuse to press charges (see August 8, 2005). The three will consider a lawsuit against the Bush administration alleging that their First Amendment rights were violated. According to another member of the group, Internet technology worker Alex Young, officials will tell them the next day that they were identified as belonging to an organization called “No Blood for Oil.” Young denies that any of the three belong to any such group, acknowledges that the car they take to the event had a bumper sticker with a similar phrase attached to its rear bumper, and says, “I don’t think a bumper sticker on a friend’s car should disqualify me from seeing the president.” The three belong to the Denver Progressives, described by a Denver ABC affiliate as a “political activist group.” Their lawyer, Dan Recht, says: “They hadn’t done anything wrong. They weren’t dressed inappropriately, they didn’t say anything inappropriate. They were kicked out of this venue and not allowed to hear what the president had to say based solely on this political bumper sticker. The very essence of the First Amendment is that you can’t be punished for the speech you make, the statements you make.” Americans United spokesman Brad Woodhouse says the Denver incident is just the latest and most egregious example of Bush officials’ heavy-handed attempts to suppress dissent and free speech. “They’re screening the people who are allowed to come and then they’re profiling them in the parking lot,” he says. “It’s quite extraordinary, and disappointing.” [ABC 7 Denver, 3/29/2005; Associated Press, 3/29/2005] Weise and Young will file a lawsuit over the incident (see November 21, 2005).